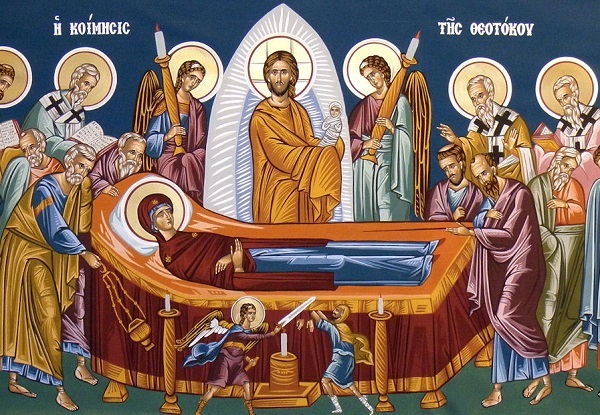 Every time we celebrate the Dormition of the Mother of God, it’s like Easter all over again; the summer Easter. Our Lady the Mother of God prepares this Easter, this ‘glorious Passover from death unto life’, for us. A second Passover, holy, spotless, life-giving for the human race, because truly, today, ‘the terms of nature are overcome’. Saint John the Damascan cried aloud: ‘How the source of life goes towards life by passing through death!’ The death of the Mother who was the source of life for the Lord Himself transcends the notion of death, so that it’s not even called death but ‘dormition’ and ‘divine translation’, or a progression or procession towards the Lord. And even if we call it death, it’s still a death that’s life-bearing, since it moves on to the heavenly and immortal life. The translation of the Mother of God as an unequivocal event which has been preserved in sacred Tradition, has been incorporated into the teaching of the Orthodox Church and has no connection with the pietist Western doctrines of the immaculate conception and deathless end to her life on earth. The Virgin was that special creation of God who transcended all other people and the angels. Of all human beings, she alone lived a spotless life and- which is inconceivable for all rational beings- became the Mother of God. Because she’d never sinned, never submitted to any thoughts of indulgent pleasure, it was right that she didn’t live on earth with carnal pleasures or suffer from illnesses. Even though she had the body which gave birth to Life, as a human being she was still subject to the sickness of death and she did indeed die. But her body and soul were not separated from God. The connection which united them was briefly broken, as had happened in the case of Christ. Because, at the moment of the Dormition of His Mother, the Lord, accompanied by the celestial ranks of the angels and saints, took her holy soul not only into heaven, but as John the Damascan says, ‘to His own royal throne, to the celestial Holy of Holies’. Our Lady’s body, which received God and gave birth to Life, was transposed after three days to those places beyond the heavens, incorrupt, to her Only-Begotten and beloved Son. A witness to this resurrection/translation of the Mother of God, was the Apostle Thomas, who had not been present at her holy burial, but, as usual, arrived late- three days in fact. He requested that the tomb be opened by the other apostles and when they did so they found that the body which had been glorified by God was no longer there. They did, however, see the Mother of God ascending to the heavens and giving Thomas her Precious and Holy Belt as evidence of her translation. This is somewhat similar to the event when the same disciple had felt the Lord’s wounds. Our Lady’s body- like that of her Son- suffered no decay in the grave, that is it didn’t change, didn’t decompose into the material elements of which it was made. Moreover, after Christ’s resurrection, the bodies of many of His saints didn’t decay and have become partially incorrupt relics. How much more reasonable it is that the ‘dwelling which received God’, the Mother of God would not decay. Saint Andrew of Crete says that the preservation of the Mother of God’s virginity at the birth of Christ has, as its natural concomitant, that her body would remain whole at the hour of her death. ‘Birth avoided degeneration and the grave didn’t welcome decay’. After her dormition, the Mother of God became the Mother of the New Creation, of the Church of Christ. Since she had the central role in the plan for salvation, because the Lord, Who is the head of the Church, took flesh from her, she now has, in the celestial Church, the whole fulness of Grace, glory and boldness. She has become the benefactress of the whole of nature and creation, which is why she is venerated by the whole of creation as Maiden, Lady, Queen, and Mother of God. Through the Mother of God and because of her, the history of the whole world entered onto a new path, incomparably more magnificent than and superior to that which had been there before. It wasn’t and isn’t possible for any thing created to be more perfect than her, nor could she herself have become more perfect than she was. According to the Fathers, there are three things that the almighty God could not have made more perfect: the Incarnation of the Divine Word; The Virgin Mother of God; and the bliss enjoyed by those who are saved.